At Ribbon Falls in Arizona's Grand Canyon, a girl stands in a small pool and reaches for the waterfall. Using its mouth, teeth and hand, a young mountain gorilla hangs from a vine in the bamboo-covered forest within Rwanda's Volcanoes National Park. A patron at the Frangipani Royal Palace Hotel in Phnom Pehn, Cambodia, relaxes in a rooftop swimming pool. 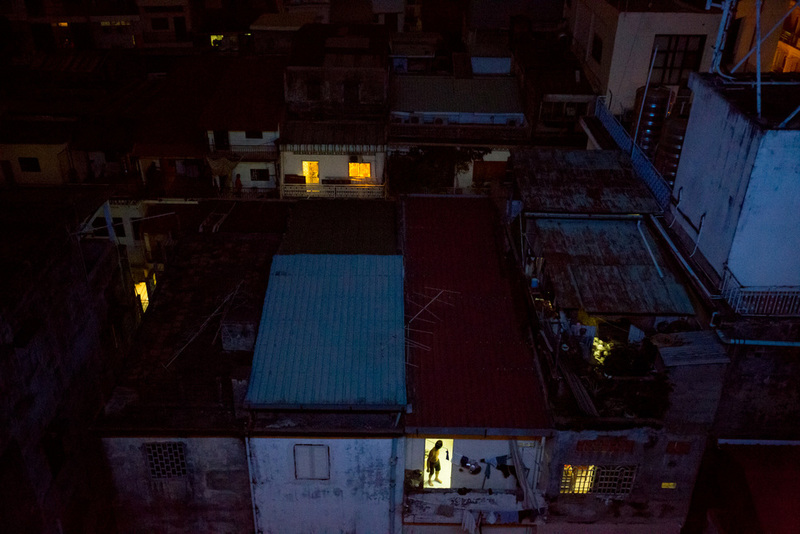 In Phnom Pehn, Cambodia, a man stands in a lit doorway among densely populated housing area. A mahout (trainer) stands near his elephant at the Elephant Conservation Center in Sayaboury, Laos. 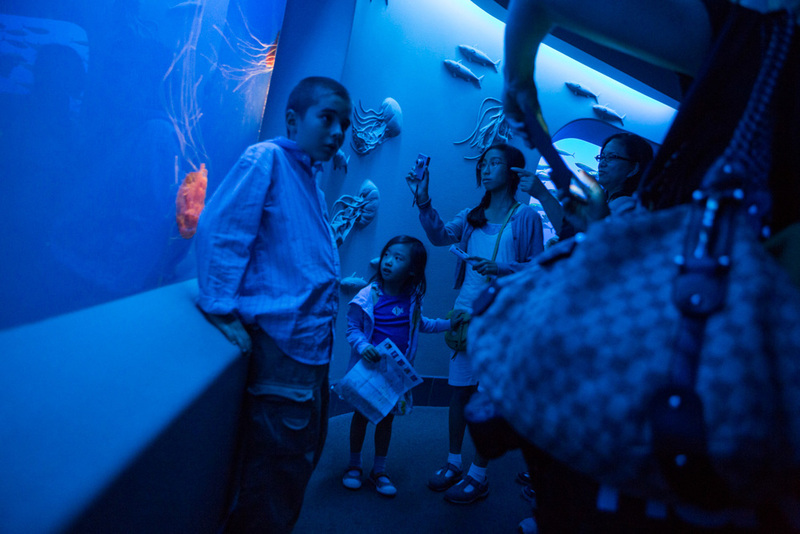 A family observes a jellyfish display at the Monterey Bay Aquarium. 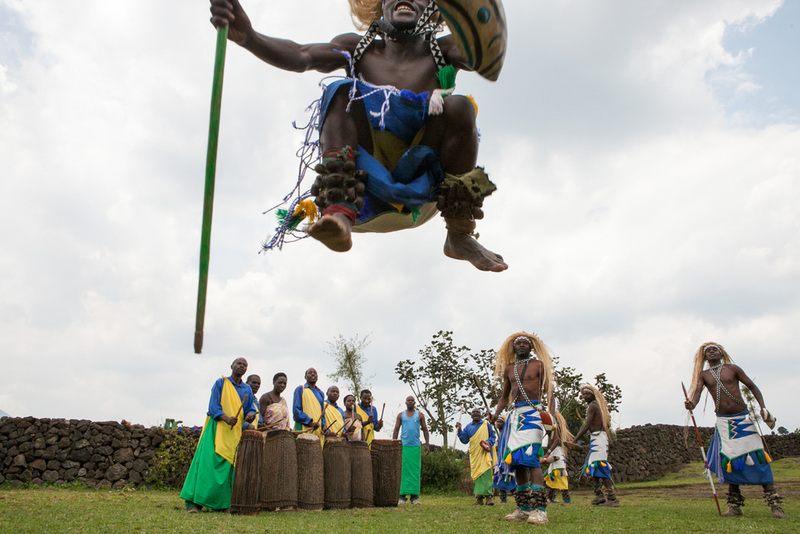 A villager dances at the Iby'iwacu Cultural Village outside of Rwanda's Volcanoes National Park. In Rwanda's Volcanoes National park, a male silverback mountain gorilla rests in the forest among bamboo, eats vegetation and looks to the sky. Several young boys stop on a hillside near Lake Bunyonyi in Uganda. 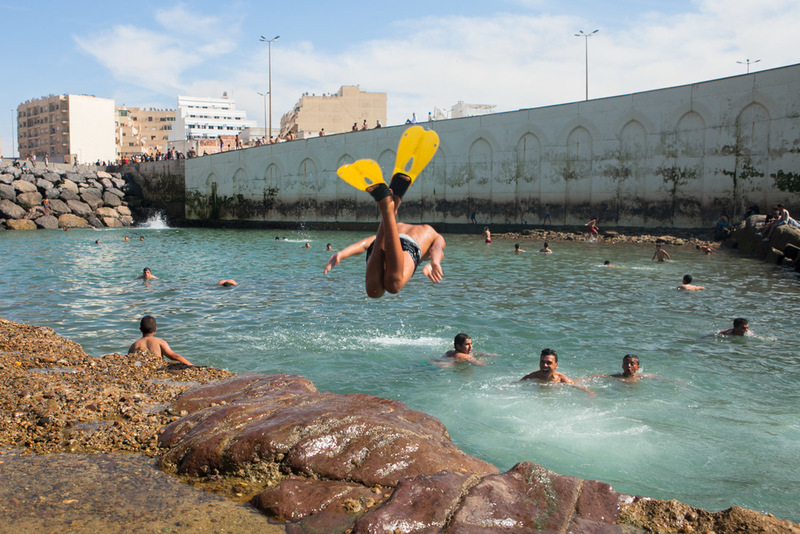 In Casablanca, the conservative metropolis of Morocco, dozens of young boys don swimming suits and buck the trend on a hot summer day. A break-wall, protecting the city from rising seas, combined with rock formations, makes the perfect locale for natural pools as tides rise and recede. The swimming hole grants locals a retreat for relaxation during intense Moroccan summers. One boy, adorned with brightly colored flippers, dives headfirst into the pool. On a hillside outside Chefchaouen, Morocco, children transform a sturdy tree into a central playground that houses multiple swings and offers an area for fun. But with many kids vying for space, one child is struck by another and is flung forward. 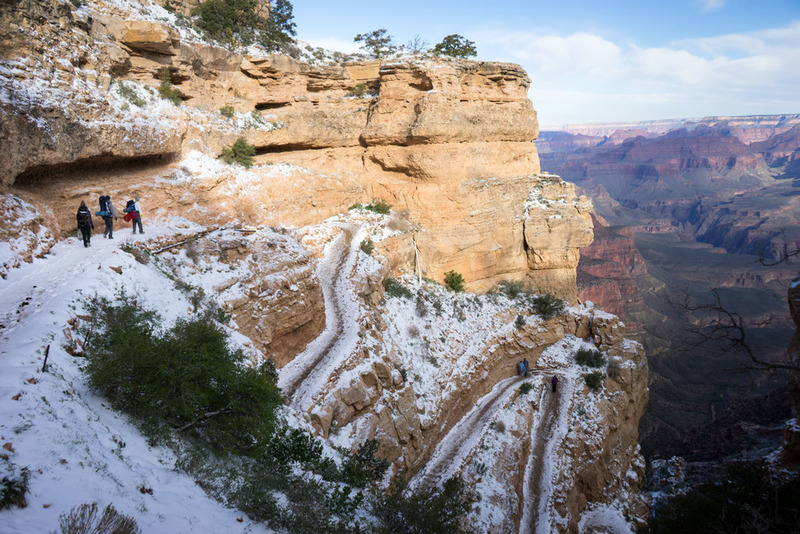 With a fresh coat of snow on the ground in Arizona, several hikers being the trek from the South Rim of the Grand Canyon along the South Kaibab Trail. 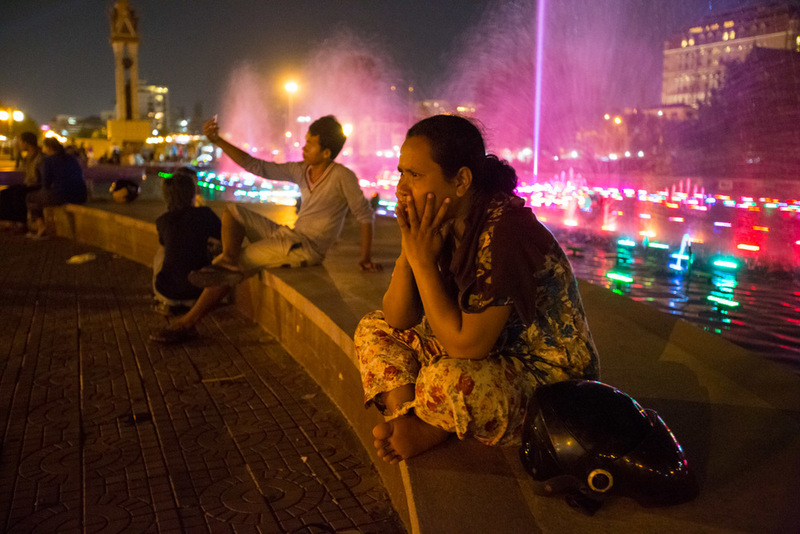 In Phnom Pehn, Cambodia, a local sits near a night-time fountain light show. A visitor to the Angkor Thom complex in Cambodia has her picture made with a group of boys and girls who are in traditional costume. Several other visitors wait nearby for their opportunity. 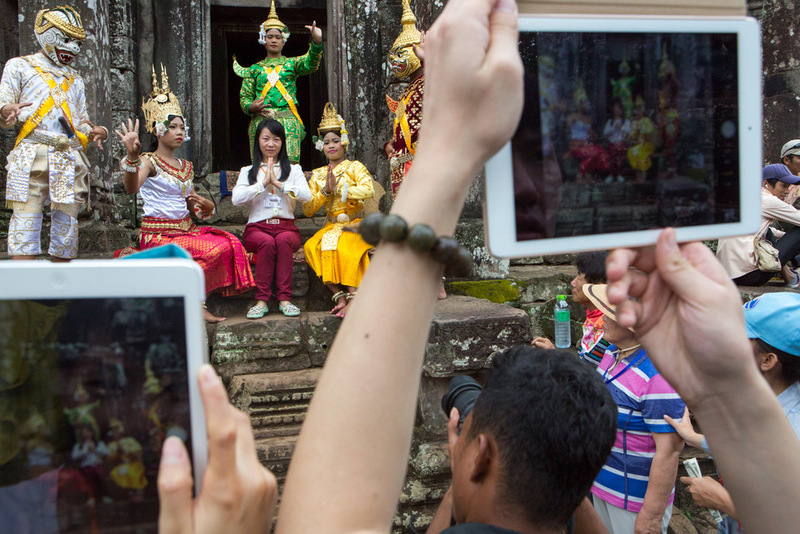 The boys and girls dress in costume and make a living by standing in the Angkor complex and posing for pictures with tourists. A young girl dons a costume inside the Angkor Wat Temple in Cambodia. She dresses in costume to pose for photos with visitors. At the Elephant Conservation Center in Laos, a mahout (elephant trainer) jumps between two elephants. Since becoming a photographer, I have visited and photographed dozens of countries, as well as criss-crossing America. Here is a collection of some moments captured along the way.